Yes you read that correctly... this is a Deep Fried Steak Recipe. 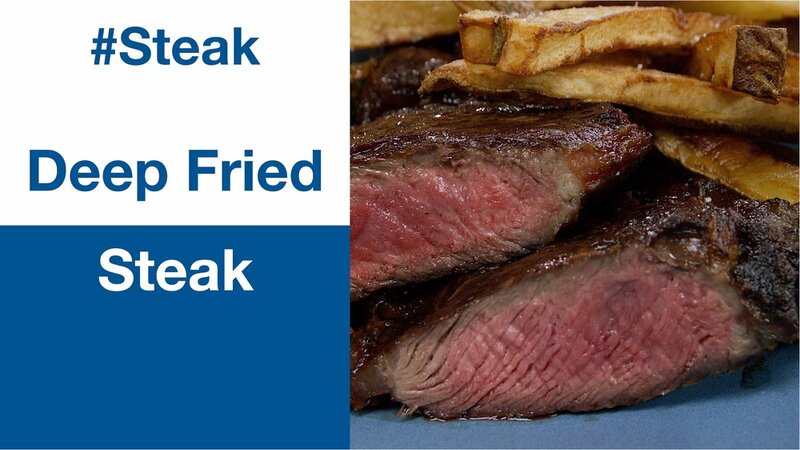 I hear you - why would you deep fry a steak? Because you get incredibly even cooking across the steak, an amazing flavourful browned crust, and the juiciest interior you ever had. That's why. Yes you read that correctly... this is a Deep Fried Steak Recipe. I hear you - why would you deep fry a steak? Because you get incredibly even cooking across the steak, an amazing flavourful browned crust, and the juiciest interior you ever had. That's why. This isn't a 'Chicken Fried Steak', there is no coating, we're frying the best of the best. You could use pretty much any cut of steak for this recipe that you like. We would suggest a cut that's between 1.5" and 2" thick. Heat a heavy bottomed pot with a deep frying oil of your choice: Canola, Peanut, or Beef like we did. Heat oil to about 360ºF and immerse the steak. Oil temp will drop, so at this point strive to maintain 350ºF. Use an instant read thermometer to test internal temp often - we pulled at 120ºF for a rare / medium rare. temp by 10ºF, or so.